Could a role-playing game like Final Fantasy work as an episodic series like Lost? That's the driving question behind Tempus Chronicle, an upcoming Facebook RPG by a group of developers called Tista Games who say they want to make a game with characters compelling and relatable enough to keep you coming back week after week for more. Speaking to Kotaku in an e-mail, Tista CEO Aunim Hossain said their goal is to "tell a story that does as good a job at building great characters" as games like Final Fantasy VI and television shows like Lost. "We combine the best of both worlds — a video game medium that lets you get involved and play through the plot combined with a TV show medium that lets us selectively focus on different characters to show a more complete picture," Hossain said. 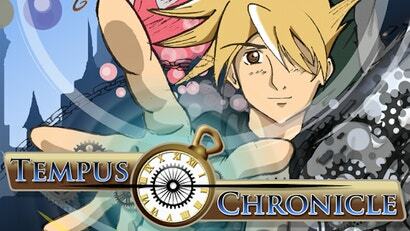 Every Tuesday at 6pm, you'll be able to access a new episode of Tempus Chronicle. The rest of the week, you can play the game and discuss the story with your friends on Facebook and other message boards. It's a neat idea that could cultivate a loyal and passionate group of dedicated fans — if it's good. Like everybody and their mother these days, Tista Games has launched a Kickstarter to support this project. They want to raise a whopping $US200,000 to fund "a full season" of 24 episodes. Though they plan to launch the game whether or not they meet their goal, Hossain says that funding will allow Tista to release the whole thing for free. The story revolves around two boys who figure out how to use their pocket watches to travel through "time gates" not unlike Chrono Trigger. They open a time gate to search for their missing mother, eventually finding themselves on the ill-fated Titanic cruise liner in 1912. On the ship, they meet up with other time travellers and try to figure out just how the hell to get out of there. "We think that Facebook games have the potential to evolve into a much better gaming platform. And we want to be at the forefront of the Facebook gaming revolution." "Along the way, the boys will... learn about the secrets of time travel and learn to control it, they'll each fall in love with very different people, they'll be separated from each other, and they'll search for their mother," Hossain said. "We have a lot of other twists and turns that we're excited to present to you." Sounds interesting, no? If this game can successfully blend the cliffhanger-packed addiction of a series like Lost with the charm that made classic titles like Chrono Trigger so appealing, it could really be something. Although I'm not a huge fan of the art style they use in their Kickstarter video (a cookie if you can spot the placeholder art from Final Fantasy VI), I love the idea of an ongoing weekly RPG series that feels like a TV show. "In our episodic medium, like Lost, we will be able to really flesh out our characters," Hossain said. "We'll have episodes that focus on one of the characters and show their histories, motivations, and insecurities." And Hossain knows what some of you are thinking. A Facebook game? No way in hell am I touching that. But he says this will be different than most Facebook games you've seen. "Admittedly, Facebook games have historically been focused on the casual market and have utilized very limited (and tedious) mechanics," he said. "But we think that Facebook games have the potential to evolve into a much better gaming platform. And we want to be at the forefront of the Facebook gaming revolution." It won't use any sort of energy mechanic, Hossain says. You'll be able to play as long as you want. And you won't have to invite your friends to get ahead. The game won't spam your wall or continuously ask you to post things on your news feed. "We want you to feel as though you're playing a real old school RPG that happens to be on Facebook," he said. "We're creating the old school JRPG that we've been dying to play, we're releasing it on Facebook to revolutionise the way games are made on that platform, and we're hoping to pioneer a new genre of weekly scheduled episodic games." I'm a little disappointed. I thought it was going to be like Defiance, the interlinking of an MMO and TV Series. It's also going to be incredibly difficult for them to make this work. While it's really easy to break up an RPG into chunks (RPGs have an underlying notion of chapters/quests already), there's the question of how you keep a player interested between episodes. The closest answer we have today is an MMO and instance grinding between content drops which doesn't really work in a single player RPG. I admire them for having such lofty goals, and I'm curious to see where this thing ends up but I have doubts as to whether it can work in its current form. Now, if people could provide their own stories in the universe and you simply import your character then that would be something very interesting indeed.